There are a lot of photographers on the Big Island of Hawaii to chose from. Some have been here for a little while, some do it as a part time job to earn a little extra money and then there is me and others that do it full time and professionally and have been here for over 15 years. I believe choosing a photographer that has been on the islands and is familiar with the resorts and local spots makes a big difference in your wedding photography. 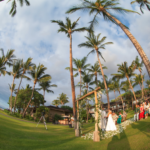 This couple was married at the Hapuna Prince on the Big Island of Hawaii. They had the ceremony at Turtle Point and then did photos on the lawn and down on the beach.